Scientists have long hoped that stem cells might have the power to treat diseases. But it's always been clear that they could be dangerous too, especially if they're not used carefully. Now a pair of papers published Wednesday in the New England Journal of Medicine is underscoring both the promise and the peril of using stem cells for therapy. In one report, researchers document the cases of three elderly women who were blinded after getting stem cells derived from fat tissue at a for-profit clinic in Florida. The treatment was marketed as a treatment for macular degeneration, the most common cause of blindness among the elderly. Each woman got cells injected into both eyes. In a second report, a patient suffering from the same condition had a halt in the inexorable loss of vision patients usually experience, which may or may not have been related to the treatment. That patient got a different kind of stem cell derived from skin cells as part of a carefully designed Japanese study. The Japanese case marks the first time anyone has given induced pluripotent stem (iPS) cells to a patient to treat any condition. "These two reports are about as stark a contrast as it gets," says George Q. Daley, Harvard Medical School's dean and a leading stem cell researcher. He wrote an editorial accompanying the two papers. "It's really striking." The report about the three women in their 70s and 80s who were blinded in Florida is renewing calls for the Food and Drug Administration to crack down on the hundreds of clinics that are selling unproven stem cell treatments for a wide variety of medical conditions, including arthritis, autism and stroke. "One of the big mysteries about this particular case and the mushrooming stem cell clinic industry more generally is why the FDA has chosen to effectively sit itself out on the sidelines even as this situation overall grows increasingly risky to patients," says Paul Knoepfler, a University of California, Davis, stem cell researcher who has studied the proliferation of stem cell clinics. "The inaction by the FDA not only puts many patients at serious risk from unproven stem cell offerings, but also it undermines the agency's credibility," Knoepfler wrote in an email. In response to a query from Shots, an FDA spokeswoman wrote in an email that the agency is in the process of finalizing four new guidelines aimed at clarifying how clinics could use stem cells as treatments. The agency also noted that it had previously issued a warning to patients. In the meantime, "consumers are encouraged to contact FDA and the appropriate state authorities in their jurisdictions to report any potentially illegal or harmful activity related to stem cell based products," the FDA email says. Other researchers say the cases should stand as a warning to patients considering unproved stem cell treatments, especially those tried outside carefully designed research studies. "Patients have to be wary and tell the difference between the snake oil salesmen who are going to exploit them and the kind of slow, painstaking legitimate clinical trials that are also going on," Daley says. The New England Journal of Medicine report did not name the Florida clinic, but noted that the treatment was listed on a government website that serves as a clearinghouse for research studies. The sponsor is listed as Bioheart, Inc., which is part of U.S. Stem Cell Inc. in Sunrise, Fla.
Kristen Comella, the scientific director of U.S. Stem Cell, would not discuss the cases. "There were legal cases associated with eye patients that were settled under confidentiality, so I am not permitted to speak on any details of those cases due to the confidentiality clause," Comella said by phone. She acknowledged, however, that the clinic had been performing the stem cell procedures. They were discontinued after at least two patients suffered detached retinas, she says. But Comella defended the use of stem cells from fat tissue to treat a wide variety of other health problems. "We have treated more than 7,000 patients and we've have had very few adverse events reported. So the safety track record is very strong," Comella says. "We feel very confident about the procedures that we do, and we've had great success in many different indications." According to the New England Journal of Medicine report, The Florida clinic was using adult stem cells, which circulate in various parts of the body, including in fat tissue. While those cells may someday be turn out to be useful for treating disease, none have been proven to work. The body produces a variety of stem cells. The kind that have generated the most excitement — and controversy — are human embryonic stem cells, which are derived from early human embryos and can be coaxed to become any kind of cell in the body. Scientists are also excited about iPS cells, which can be made in the laboratory by turning any cell in the body, such as skin cells, into cells that resemble embryonic stem cells. Those are the cells that were tested by the Japanese scientists. The stem cells were converted into retinal pigment epithelium (RPE) cells, which are the cells that are destroyed by macular degeneration. "This represents a landmark," says Daley. "It's the first time any patient has been treated with cellular derivatives of iPS cells. So it's definitely a world first." Daley noted that the scientists only treated one of the patient's eyes in case something went wrong, to ensure remaining vision would not be threatened in the other eye. After at least a year, no complications had occurred and the patient had not experienced any further deterioration of vision in the treated eye. While that is promising, more patients would have to be treated and followed for much longer to know whether that approach is successful, Daley says. "Given that macular degeneration is the most frequent cause of vision loss and blindness in the elderly and our population is aging, the prevalence of macular degeneration is going up dramatically," Daley says. "So to be able to preserve or even restore sight would be a really remarkable medical advance." Despite the potentially encouraging results with the first patient, Daley noted that the Japanese scientists decided not to treat a second patient and suspended the study. That's because they discovered worrisome genetic variations in the RPE cells they had produced for the second patient. "They weren't certain these would cause problems for the patient, but they were restrained enough and cautious enough that they decided not to go forward," Daley says. "That's what contrasts so markedly with the approach of the second group, who treated the three patients with an unproven stem cell therapy that ended up have devastating effects on their vision." In this case, the New England Journal of Medicine report says, patients paid $5,000 each to receive injections of solutions that supposedly contained stem cells that were obtained from fat removed from their abdomens through liposuction. Even though the safety and effectiveness of this procedure is unknown, all three patients received injections in both eyes. "That's what led to these horrible results," says Thomas Albini, a retina specialist at the University of Florida's Bascom Palmer Eye Institute, who helped write the report. Before the procedure, all three women still had at least some vision. Afterwards, one woman was left completely blind while the other two were effectively blind, Albini and his colleagues reported. The cases show that patients need to be warned that something that "sounds too good to be true may indeed be too good to be true and may even be horrible," Albini says. 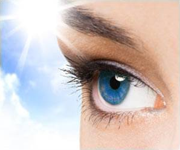 Certainly treating both eyes at the same time for elective procedures is inexcusable. Medical licenses should be under review in these cases. Even with tried and trusted treatments, specialists treat one eye at a time, such as cataract surgery or as in my case the SLT procedure. I am cutting and pasting part of a post from a friend's sister. She has a type of glaucoma caused from Stickler's Disease. Are any of your familiar with this stem cell trial and what is happening? Stem cell treatments are coming. However, in this case, I'm skeptical. I have a bad feeling that your friend's sister is being scammed. I hope that isn't the case. Maybe you could inquire and share more information with us. If this is legit, it will interest many of us. I'm reposting another message where we discussed this topic back in 2015 - see below. New research published in The Lancet provides the first evidence of the medium-term to long-term safety and tolerability of transplanting human embryonic stem cells (hESCs) in humans. hESC transplants used to treat severe vision loss in 18 patients with different forms of macular degeneration appeared safe up to 3 years post-transplant, and the technology restored some sight in more than half of the patients. In the two phase 1/2 studies, hESCs were differentiated into retinal pigment epithelium cells  and transplanted into nine patients with Stargardt’s macular dystrophy and nine patients with dry atrophic age-related macular degeneration, the leading causes of juvenile and adult blindness in the developed world, respectively. No effective treatments exist for either condition, and eventually the light-receiving (photoreceptor) cells of the retina degenerate leading to complete blindness. All participants were injected with one of three different doses of retinal cells (50 000, 100 000, and 150 000 cells) into the subretinal space (under the retina) of the eye with the worse vision. The hESC-derived cells were well tolerated for up to 37 months after transplantation. No safety concerns (eg, hyperproliferation or rejection) in the treated eyes were detected during a median follow-up of 22 months. Adverse events were associated with vitreoretinal surgery and immunosuppression, but none were deemed to be related to the hESC-derived cells. Follow-up testing showed that 10 out of 18 treated eyes had substantial improvements in how well they could see, with 8 patients reading over 15 additional letters in the first year after transplant. Visual acuity remained the same or improved in seven patients, but decreased by more than 10 letters in one patient. Importantly, untreated eyes did not show similar visual improvements. Writing in a linked Comment, Anthony Atala, Director of the Wake Forest Institute for Regenerative Medicine, Wake Forest School of Medicine, Winston-Salem, NC, USA says, “The work by Schwartz and colleagues is a major accomplishment, but the path to get to this point has not been smooth. Since the discovery of hESC in 1998, much has transpired, including political, ethical, and scientific debates, with an overall push to achieve the promise of human therapies. Now, we have follow-up that extends to longer than 3 years in patients treated with hESC-derived stem cells, showing both safety and apparent efficacy...Much work remains to be done before hESC and induced pluripotent stem cell therapies go beyond regulatory trials, but the path is now set in motion. A type of cancer that occurs when stem cells differentiate into multiple cell types and form incompatible tissues that can include teeth and hair. Retinal pigment epithelium is a cell layer that forms the outer barrier of the retina and supports the function of the light-receiving (photoreceptor) cells of the retina.